Custom monograms look great on a wall or dance floor, and you can design them to look however you want. The monogram is the design itself, which can also match your wedding program or invitation. Most of the time, we use bright, high resolution video projectors to display your monogram. Occasionally, though, we will use a a small, round piece of metal or glass that has your monogram carved into it, which is called a gobo. The gobo is placed inside a projector, which shines onto a wall, floor, or other surface. The projector we use is mounted on a tripod stand, so please keep that in mind when deciding your layout and floor plan. Pricing varies based on the complexity of your design and whether your gobo is made of metal or glass. Please request a price quote for an idea on how much it will cost for your wedding. 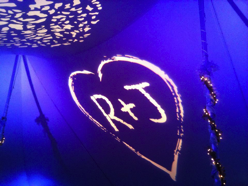 This is a custom monogram gobo projected directly onto a tent ceiling. 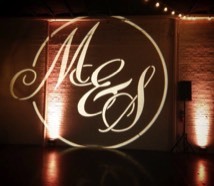 Here you see a custom monogram gobo projected onto an exposed brick wall. This feathery, custom gobo is projected onto a white, vinyl dance floor. 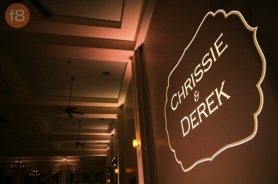 Chrissie & Derek had us project their gobo onto a wall in the ballroom, directly above their cakes. 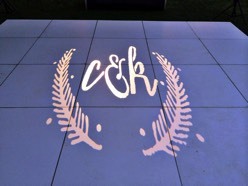 Can I use your services for only a custom monogram/gobo? Yes, however, we do have an event minimum charge depending on the area where your venue is located. We may be able to make an exception for weddings in McKinney, Plano, Frisco, Allen, and other areas in North Dallas. What is included with a custom monogram? When you add a monogram to your lighting package, it includes assistance with design, production of the gobo (if applicable), and rental of the projector. The design can include things such as initials, names, dates, designs, and pictures. We can even create full-color monograms for no additional cost. Where can I place my custom monogram? Since the projector must be placed on a tripod stand, it needs to be set up against a wall or in an area where it won't be in the middle of the floor. We usually shine your monogram onto a wall or the dance floor, and our advanced projectors have the ability to resize and keystone the image both horizontally and vertically to make it look great!